Dr. Marder was frustrated and perplexed that his patients who were suffering from itchy scalp had no over the counter product he could recommend for their use. The only medication available that he could give them was an expensive prescription medication to ease their discomfort stemming from an itchy scalp. Even with his over 30 years’ experience in dermatology, he could not offer them the help they needed because there simply was no product over the counter that could stop their itching. Therefore, Dr. Marder decided to take a non-conformist approach to solving this medical problem; he created a shampoo that has the medication necessary to stop itching, flaking and scaling. It took him five years to create this amazing shampoo. The results were well worth the long wait, and the gratification that he is able to help those suffering from itchy scalp. Kathy Habel’s husband had struggled with dandruff for most of his life. Using the same dandruff shampoo had become a way of life, yet he had not been able to get the results he desperately needed. This is perhaps why he was very ready to try Dr. Marder’s TOTAL RELIEF Shampoo and Conditioner. Mr. Habel also had flaky dry skin around the eyebrows and tried to get rid of it unsuccessfully. After using TOTAL RELIEF Shampoo, his itching, flaking and dandruff completely disappeared as did the flakiness around his eyebrows. Mr. Habel is just one in a growing list of satisfied customers who have used Dr. Marder’s Scalp Therapy products. Through nanotechnology, Dr. Marder was able to take a hydrocortisone molecule and make it stable so that it is able to penetrate the scalp. This unique patented formulation allows the hair and the skin to heal, thus returning the hair follicle and the scalp back to normal. For the first time, there is a shampoo that can restore the scalp to its original normal state. What’s more, Dr. Marder’s shampoo is the first over-the- counter solution for an itchy scalp that can be used on all hair types and by all age groups. The shampoo is called Total Relief Shampoo because it gives all patients complete reprieve and relief from their scalp issues. Its formula is multi purposed to treat dandruff, itching, flaking, and even volumizes the hair. 55% of the world’s population has itchy scalp. An itchy scalp can be caused by dandruff, hair chemicals, coloring agents and stress. The distinct qualities of this shampoo have made it a sought-after solution for many people who have for years suffered and struggled to find the perfect solution for their itchy scalp. Total Relief treats all scalp needs to restore it to its healthy natural state. Dr. Marder Skincare Total Relief Shampoo and Conditioner are already sold online at Amazon.com and Dermstore.com. It will also be available on Target.com, Jet.com and at select retail stores in 2017. According to Dr. Marder, for most patients, it takes around three days of using this formula for dandruff and itchy scalp to disappear. When people use the shampoo consistently it will normalize the follicles within two to four weeks. 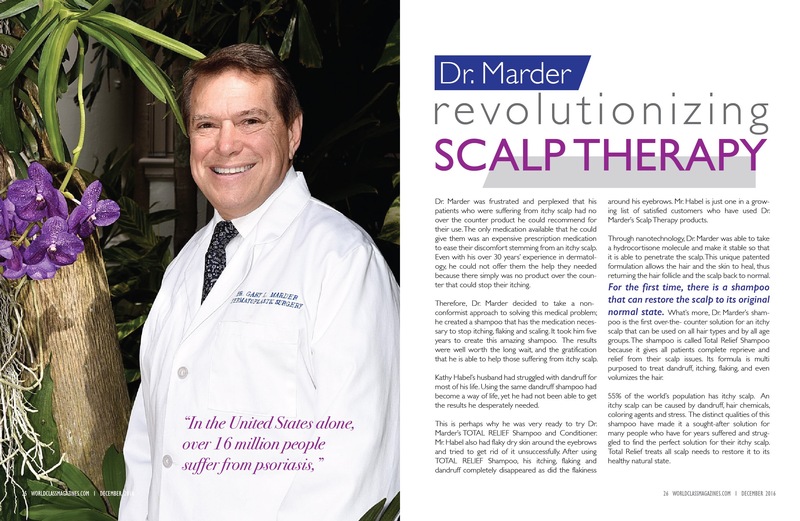 Dr. Marder will be introducing his Psoriasis Relief line. He hopes that these four products will be of tremendous help to people who have struggled with psoriasis for most of their lives. Dr. Marder is the Medical Director of Marder Dermatology, Cosmetic Surgery and Skin Cancer Center. He is a board-certified dermatologist and the founder of Dr. Marder Skincare. His practices are located in Port Saint Lucie, Okeechobee and Palm Beach, Florida. Dr. Marder lives in Palm Beach, Florida with his wife, and is the proud father of six children and two granddaughters. 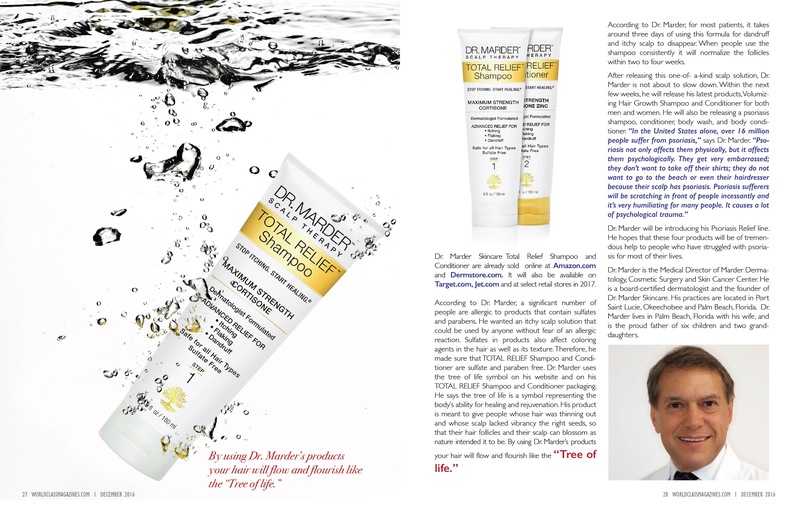 Get Dr. Marder’s Skin Care Here.